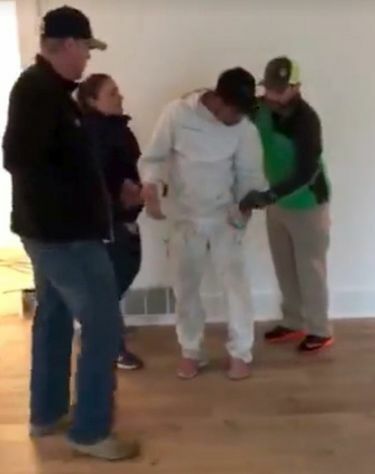 The arrest, captured on video, reflects a trend — according to the Oregon ACLU — of ICE targeting people for deportation while agents are dressed in plainclothes and not identifying themselves. SALEM, Ore. — After walking through the door of a home in Oregon, federal immigration officers acknowledged they didn’t have a warrant. Still, they refused to leave until they arrested a man who was inside and had been helping remodel the house. The incident Thursday in a Portland suburb was caught on camera by the man’s co-worker and generated an outcry. The man, identified by the senators as Carlos Bolanos, was released after the video was posted on Facebook. Immigration and Customs Enforcement (ICE) is reviewing its officers’ actions and has referred the incident to its Office of Professional Responsibility and to the inspector general of ICE’s parent organization, the Department of Homeland Security, ICE spokeswoman Yasmeen Pitts O’Keefe said in an email. The video shows significant wrongdoing by the federal officers, said Mat Dos Santos, legal director of the American Civil Liberties Union of Oregon. It also reflects a disturbing trend of ICE targeting people for deportation while agents are dressed in plainclothes and not identifying themselves, Dos Santos added. “It’s all too common. We see it time and time again where ICE officers actively engaged in pursuing someone show up in plainclothes, don’t display badges and get incredibly aggressive when met with natural shock by those they are targeting,” Dos Santos said. Cardenas then asks the agents for a warrant. “We don’t need a warrant to come in this home,” the agent says. Then Cardenas points his cellphone camera at two of the agents inside the house, a man and a woman who refuse to give their names. Bolanos tries to call the homeowner but can’t reach her. In the video, the agents insist Cardenas invited them inside, which he denies. After seven minutes, the agents surround Bolanos while he is talking on a cellphone. They take the phone from one hand and a paintbrush from another as an agent warns him not to resist. They cuff his hands behind his back and put him into a car. The Democratic senators asked for results of any reviews of the incident, an explanation of policies that led to Bolanos’ arrest, and for measures that may be undertaken to “correct inappropriate and potentially unlawful behavior” shown by agents in this and other incidents. Cardenas said Bolanos has four children in Oregon, and that they’re all U.S. citizens. Activists have said that aggressive enforcement of immigration laws will tear such families apart. People who believe immigration laws must be strictly followed have objected to Oregon’s status as a sanctuary state, saying it encourages criminality and takes away jobs from citizens. After Bolanos was set free. Cardenas drove to pick him up. “I think the outcome would have definitely been different if I didn’t record (the incident) or if I wasn’t a U.S. citizen,” Cardenas said. Dos Santos said the agents violated the Fourth Amendment.